Location: South side of the junction of Smalldale Road/Batham Gate Road, Peak Dale. Date closed completely: Station still open as a freight depot. Present state: Northbound station building and part of the platform still exists. Remainder demolished. Date of visit: 15 August 2008 and 4th October 2009. Notes: Peak Forest station was located on the Midland Railway (MR) main line route that ran between Manchester Central and Ambergate. The MR had opened a line in stages between Ambergate and Buxton by the 1st June 1863. However the company's real goal was to get to Manchester. The original idea had been for the line to continue westwards from Buxton but opposition from the London North Western Railway (LNWR) and geological factors forced the MR to think again. the proposed route for the line which had been surveyed by company engineers. Whilst driving down a narrow lane they came across a cart which was carrying the Director and two officers of the Manchester Sheffield and Lincolnshire Railway (MSLR). The two groups got to talking and discovered that each was looking at the same route for a railway. Rather than waste time and energy competing against each other the group retired to a hostelry for food and drink. They spent the rest of the day together and reached an accord. In 1862 an act was passed giving the MR authority to build a line from Blackwell Mill to Chinley and beyond to make an end on connection with the MSLR line at New Mills. The act was called the ‘Rowsley and Buxton Extension Line’. The MR was very interested in the part of the route that passed through Great Rocks Dale and Peak Forest as there were many quarries opening up that would prove to be a good source of income for the company. A site was picked for a station which would serve the area. The location was an equal distance between the settlements of Peak Forest and Dove Holes. 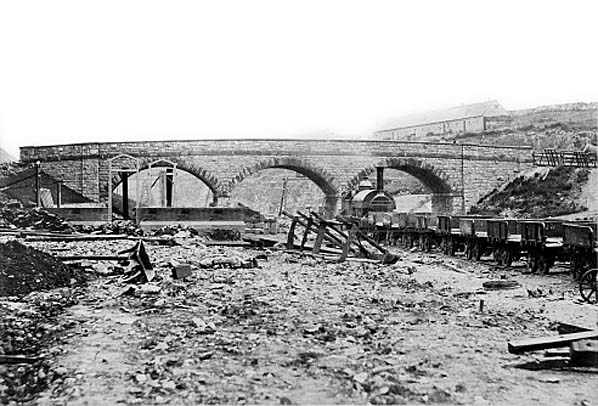 The location for a station had been decided on the 19th October 1863 during a tour of inspection. carried the road between Buxton and Peak Forest. The station was provided with two platforms. The main building was located on the west side of the line on the Manchester direction platform. It was a brick building that had a single storey booking office attached to a two storey station master's house. On the London/Buxton direction platform a simple brick built waiting shelter was provided. The station was built by a local contractor called John Ashwell. An approach road led to the main station building and a path linked to the southbound platform. Passengers had to cross from one side of the line to the other by using the road bridge or a barrow crossing at the north end of the platform. Extensive goods facilities were provided so that local quarry traffic could be captured. The goods facilities developed over the years to such a degree that they dwarfed the passenger station. Peak Forest Station was quite some distance from the nearest villages at Dove Holes and Peak Forest. From the start it was served mostly by local trains running between Buxton and Manchester and between Derby and Manchester. 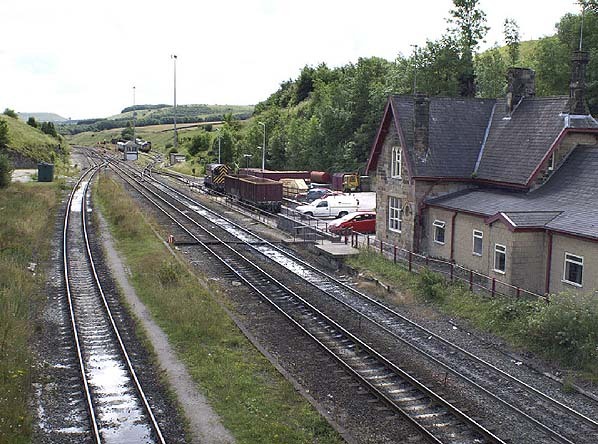 is noticeable, however, that the average revenue per ticket was less than 6d, indicating that most journeys were to Buxton, Millers Dale, and Chapel-en-le-Frith. By the early 1920s about 80 people per day used Peak Forest station. In 1922 the station was served by nine northbound trains and eight southbound. Four of the northbound services had originated at Derby and traveled on to Manchester Central. Three of the services going north had originated from Buxton and went forward to Chinley. Two services ran from Buxton to Manchester. In the southbound direction passengers at Peak Forest station had four services to Buxton and four to Derby. In 1923 Peak Forest station became part of the London Midland and Scottish Railway (LMS). The LMS expanded the service to eleven trains in each direction but fewer of them went forward to Manchester passengers having to change at Chinley. to his superiors just how much money the LMS earned from ICI and he kept his job. During the Second World War train services were reduced to seven northbound and six southbound services. On the 1st January 1948 Peak Forest station became part of the nationalised British Railways (London Midland Region). By the 1960s there were only four southbound services and six northbound trains still calling at Peak Forest. Peak Forest lost its goods service on 15th January 1964 although private sidings remained open and are still open. On the 14th June 1965 the station's name reverted to simply Peak Forest (though this shortened name had been used on tickets from about 1940).. 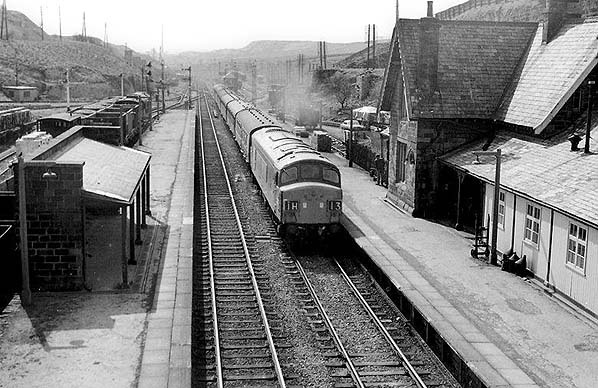 The Beeching Report of 1963 had recommended the closure of all the stations between Matlock and Chinley. 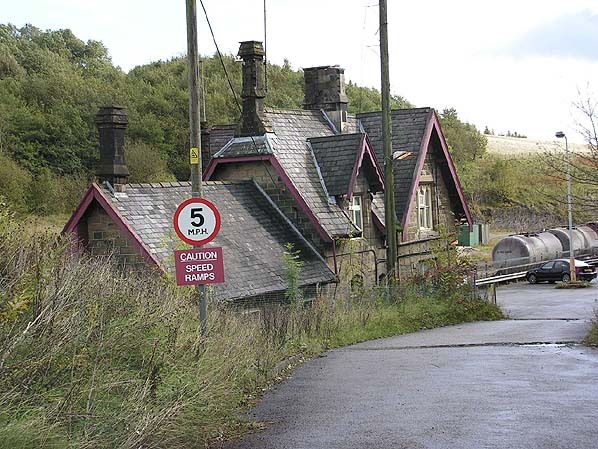 Peak Forest closed to passenger services on the 6th March 1967.
building is very much intact. It has been used since closure as office accommodation and a train crew sign on point for at first BR and in the post 1994 privatisation era by EWS and more recently by DB Shenker. 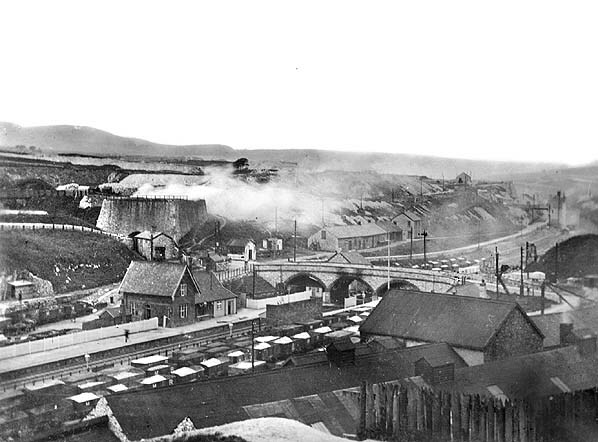 Looking north during the construction of Peak Forest station probably in about 1864 or 1865. The doorframes for the station building can clearly be seen. In the picture work is also progressing on the line itself with the road overbridge appearing to be complete. 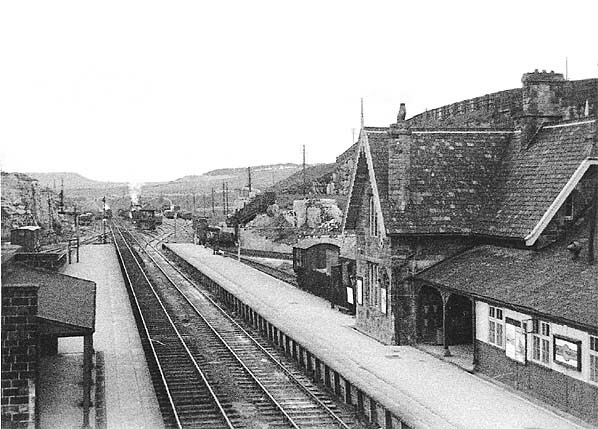 Peak Forest station looking northwest in 1913. Looking south at Peak Forest station from the road overbridge in 1948. Looking south at Peak Forest station from the road overbridge c.1967. Little change since closure apart from the removal of signs and notices. 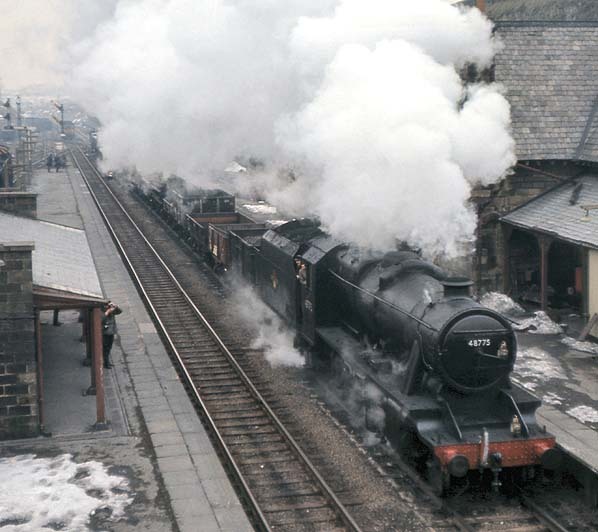 Stanier 8F 2-8-0 48775 storms northwards through Peak Forest station on 4th March 1968, the last day of steam out of Buxton (LNWR) shed. Photo by Mike Morant from his Old Pix brought to the Fore web site. Click here for a gallery of 21 colour pictures of the last day of steam at Buxton. 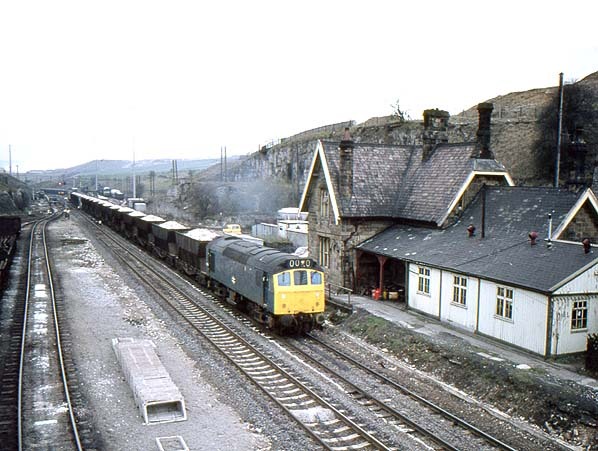 Peak Forest station looking south in April 1976. By this date the up platform has been completely removed and the down platform has had its edge stones removed. Looking south at the site of Peak Forest Station in July 2007. The down platform is now further degraded and the position of the up platform is still clearly visible. Photo John Law from his Everything on Rails web site.